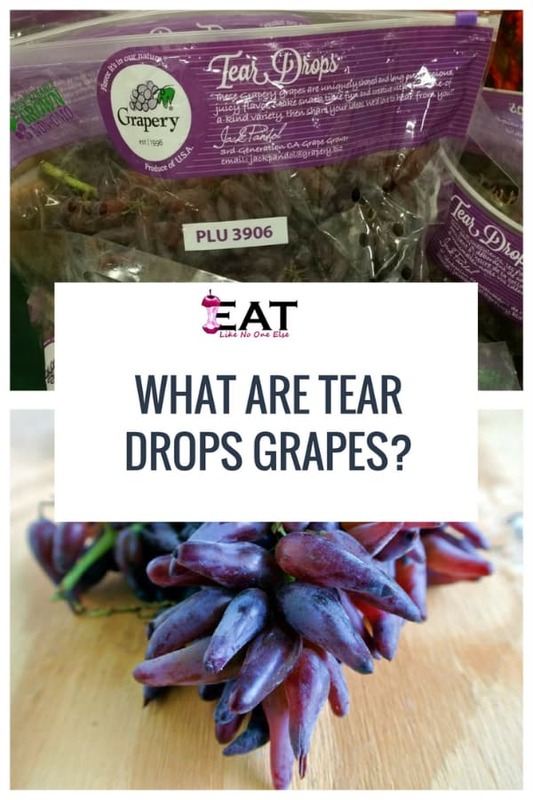 What are Tear Drop Grapes? I said it before and I will say it again – we are entering into a ? grape time of year. The grape section of the produce department is about to come alive with all the shapes, flavors, and colors of the grapes from Grapery. One of the first ones they harvest each season is the Tear Drop grape. You may have know it under it’s previous name of Witch Fingers (we will cover that topic in a moment). I clearly remember the first time I had these grapes. Found them as Witch Fingers at a store that no longer exists – it was bought out by Kroger. I was so pumped to see them in the stores then and I still get excited when I see them now. They are one of my wife’s favorites. 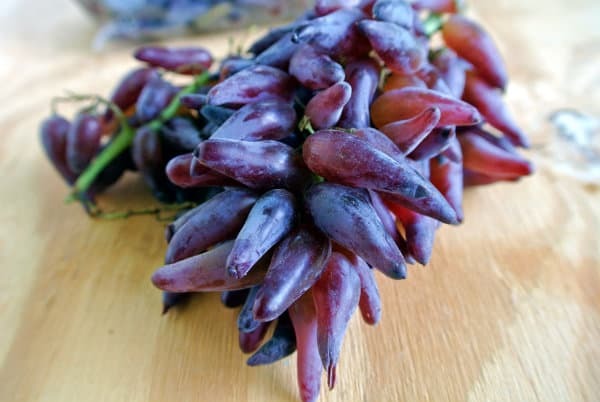 The first commercial Tear Drops grapes were released in 2011 as Witch Fingers grapes. The first time I heard about them was in 2012. I had to patiently wait for my first bite til 2013. Long before that, the Grapery had been developing these strange shaped grapes. Originally they were going by the name Chili Pepper Grapes. They do resemble the shape of some chile peppers. The very hot Thai chile comes to mind. However do you think my kids would be excited to eat Chili pepper grapes? Probably not. Plus, I can imagine customers approaching produce workers with questions about whether the grapes were spicy or not (you may laugh but trust me, after years working in the produce business I have heard it all). From a marketing standpoint the name Chili Pepper grapes was not going to fly. As the Grapery was sampling them, people started saying that they look like Witch Fingers. Light bulb moment. Grapery decided to roll with that name and Witch Fingers were released to the world. 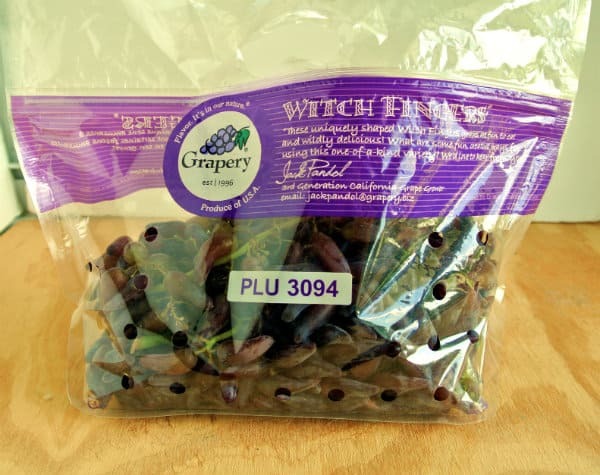 Here is a bag of Tear Drops grapes under their former name of Witch Fingers. In 2016, Grapery decided to make the change from Witch Fingers to Tear Drops. The feedback they got from customers indicated that people felt weird about eating a “finger”. Grapery is passionate about listening to their customers. They want the feedback. It’s a wonderful quality to see in a company, it is one of the reasons I am a big fan. What’s So Special Besides the Shape? Why should I care about an odd shaped grape? Let me tell ya the many ways you should care. The grapes have a texture unlike any other grape you have had before. The skin to flesh ratio is different which gives them a certain snap like no other grape. They are definitely an Eat Like No One Else thing 🙂 The flavor itself is outstanding. The taste is similar to what you may have had before in a red grape just with the flavor turned up. Put it all together and Grapery has another hit on their hands. Let’s not take for granted the challenges that had to be overcome to get Tear Drops into the bag and into our mouths – may possibly have taken a lot of blood, sweat, and TEARS! Grapery co-CEO Jim Beagle told me that they are among their hardest varieties to produce. The number one challenge is something the grape industry calls shatter. Shatter is when the grape detaches easily from the stem. When you buy a bag of grapes you will often find loose ones in the bottom of the bag. The greater the tendency of a grape to fall off the vine, the more you will find in the bottom of the bag and those are the grapes that tend to go bad quickly. This is why remove these grapes when I buy a bag, so I don’t waste my money. Tear Drops’ tendency to shatter reduces their shelf life. Tear Drops are also more susceptible to heat and wind damage. Factor all these things in and it is a challenge to reach levels of production that will be economical for Grapery. Are Tear Drops Grapes GMO? No way. 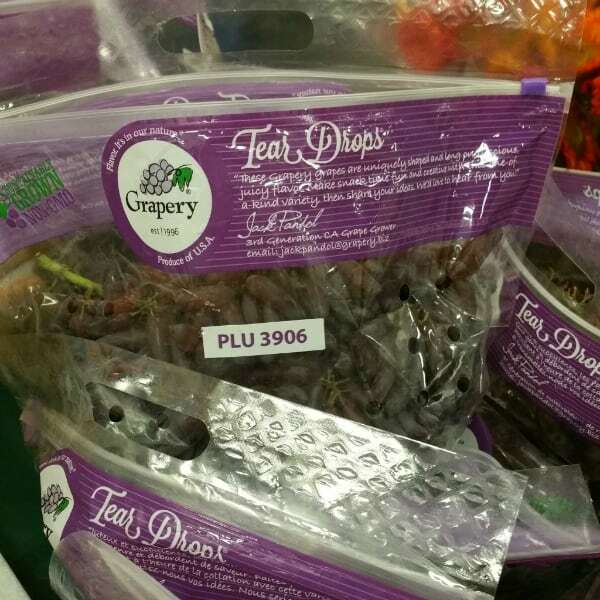 Tear Drops and all of Grapery’s grapes are non-GMO. They were created through natural plant breeding, like every many other new varieties of fruits and vegetables have been developed over the years. Grapery also employs innovative and sustainable farming techniques that help produce the most flavorful grapes possible. When Will Tear Drops Grapes Be in Season? Tear Drops are one of Grapery’s earliest varieties. Thy help kick off the season on a high note. They are available in late July to mid-late August. It is a short widow. Availability is very limited as well. They don’t have as many vines as they do for Cotton Candy or Moon Drops. Grapery has a store locator on their website that can be used as a starting point. It’s not possible to keep track of individual stores though. It’s best to contact the stores on the list. If you need help finding them leave a comment below. Also if you have found them, leave a comment sharing with us the store and the city. A display of Tear Drops grapes that my mother in law snapped a photo of. Taken at Sprouts in Mission Viejo, California. A couple stores I recommend looking at are Whole Foods Market, Sprouts, and Wegmans. All of these stores have been pretty big Grapery supporters in the past. Want to be updated on when all of Grapery’s varieties hit stores? Sign up below for the Cotton Candy Grape Mailing List. Sign up to get updates on when Tear Drops, Cotton Candy grapes, and more will be in stores. Previous Post: « When are Elderberries in Season? I always have good luck finding all the grapefruit varieties at the Wegmans location in Harrisburg, PA. Love, love, love these grapes! Thanks for sharing. I love Wegmans. I have only been there a couple times while staying in Buffalo, NY. Great produce selection. They make some really fun displays for Cotton Candy grapes. The Fresh Market in Lynchburg Virginia carries The Grapery’s grapes. I have a big bowl of Tear Drops in the refrigerator now. Glad to hear it. Heard a lot of Fresh Market stores have them in stock. Hello, I have NEVER heard or seen this type of grape before in my 46yrs on earth until I walked into Stop & Shop in Brooklyn NY on Sat 9/22. I tested 1x grape before I purchased it and was AMAZED, it was delicious and seedless just like a regular grape. It was very heard convincing my kids to try it. I will definitely look for them next season.